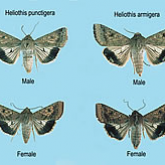 Two species of helicoverpa are serious pests of field crops (particularly grain legumes, summer grains and cotton) in the northern grains region of Australia. Helicoverpa armigera is generally regarded as the more serious pest because of its greater capacity to develop resistance to insecticides, broader host range, and persistence in cropping areas from year to year. parasitised eggs are mostly black. armigera have a saddle of darker pigment on the fourth segment and at the back of the head and dark-coloured legs. punctigera have no saddle and light-coloured legs. 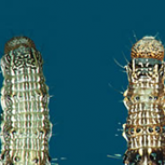 large larvae of H. armigera have white hairs around the head; H. punctigera have black hairs around the head. tail spines of H. armigera are more widely spaced than those of H. punctigera. H. armigera has a small pale patch in the hindwing; the dark section is uniform in H. punctigera. H. punctigera numbers in cropping regions fluctuate based on conditions in inland breeding areas. H. punctigera attacks broadleaf species (e.g. cotton, chickpea, sunflower, soybean, mungbean, navy bean, lucerne, canola, peanut, faba bean, safflower, linseed and azuki bean). It is not found on grass or cereal crops (e.g. wheat, barley, sorghum or maize). H. armigera will attack all field crops but is less common in wheat and barley. Larvae feed on leaves but are most damaging when feeding on growing terminals, buds or squares, flowers, pods, seed and/or fruit. Damage also occurs through bud/fruit shedding and reduced quality. in cold conditions, H. armigera pupae will diapause (hibernate). 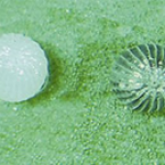 Eggs are most commonly laid on the top third of the plant and growing points. other crops from budding/flowering through to maturity. Visit the Beatsheet for threshold calculators in chickpea and sorghum. All stages of the helicoverpa lifecycle are attacked by a wide range of predators and parasitoids. Conserve beneficials in the crop by avoiding broad-spectrum insecticides to help prevent/minimise the need for insecticide treatments. Formulations of pathogen-based insecticides are available commercially, including Bt (Bacillus thuringiensis) and NPV(nucleopolyhedrovirus). Ensure you correctly identify the species present when you consider management options, as H. armigera has developed resistance to a wide range of insecticides. Products are available that reduce the impacts on natural enemies in the crop. Larvae are best targeted when smaller than 7mm. Biopesticides such as NPV work particularly well in crops with narrow flowering periods, such as sorghum. Attract-and-kill formulations such as Magnet® have been used in area-wide management programs to reduce populations. Pupae-busting (cultivation to 10cm at the end of the season) is used to disrupt the pupal stage of the lifecycle. 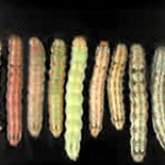 Several genetically modified crop varieties produce a natural toxin based on a bacteria that specifically targets caterpillar larvae—helicoverpa is not usually a problem in these crops.